Blessed with a capacious waterway, Hampton on Thames had a ready means of communication with the outside world from the earliest times. This artery allowed the Court to pass between the Royal Palaces of Westminster, Sheen, Hampton Court, Oatlands and Windsor. It also allowed prehistoric settlers to reach the Hurst, and Viking raiders to reach and pillage Chertsey Abbey. Goods including timber, coal, lime and manures passed through Hampton and some were brought to the Town Quay at Bell Hill. So was fuel for the Waterworks, which was unloaded at its own special quay at Platt's Eyot. Military traffic became possible with the opening of the Wey and Arun canal, should it be necessary to repulse a French invasion of the South Coast. In contrast, the long-distance traveller had only two major roads: the Portsmouth road nearby at Kingston, and the Bath road at Hounslow. These were separated by Hounslow Heath, notorious for its highwaymen , and very likely the scene of Tony Lumpkin's circumbendibus, as those who have enjoyed She Stoops to Conquer will remember. To reach the Portsmouth road the traveller from the Middlesex bank had to cross the Thames at Kingston Bridge or by one of the many Ferries. Hampton had its own ferry; first established in the sixteenth century, Hampton Ferry is still going strong. Apart from the road that roughly paralleled the Thames, (now the A308), other roads in the village were no more than farm tracks, not for the serious traveller. Today, the position is very different. The advances in road engineering in the eighteenth century opened up hitherto inaccessible tracts, making it far easier to develop land and carry away its produce, and to bring the workers and materials which that development needed. In the nineteenth century public transport , prompted partly by the growth in the population, was paralleled by the speculative development of railways. Both modes were designed as people movers, although the railways became the prime movers of goods later in the century ; that role has now largely disappeared from the local scene. Hampton railway station was opened by the London & South Western Railway in 1864. 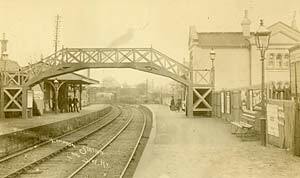 The first passenger trains from Shepperton ran towards Richmond and the City, but today the main half-hourly service runs to Waterloo via Kingston. Nowadays, only four trains run to Waterloo via Richmond, during the morning and evening rush hours. Little evidence remains of the goods yard, which in 1904 could handle furniture vans, portable engines, machines on wheels, livestock, horse boxes and prize cattle vans, and had a 10 ton crane. The coal yard was served by a siding passing behind the Railway Bell. Hampton also had a second railway system!. This narrow gauge system was built to carry fuel from the Waterworks wharf to the various engine houses on the site, and extended to serve the Waterworks at Kempton Park. Few traces survive, but there is a group of enthusiasts who wish to rescue what is left. 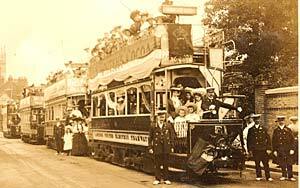 Public road transport was much improved in 1903 with the opening of Fulwell Depot, despite the indifference of most of the local authorities. 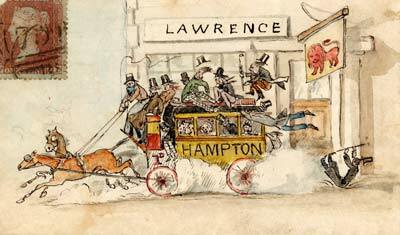 Tramcars ran down through Hampton Hill to the river where they turned left for Hampton Court. The trams were replaced by trolley buses in 1931, which were replaced in turn by omnibuses in 1962. Today there are services connecting Hampton with Kingston, Richmond, Staines, Hammersmith and Heathrow airport. More specialised transport needs are met by various School Bus services and transport for the disabled can be arranged through the Greenwood Centre and Linden Hall.